Whether we admit it or not, we’re in a serious relationship with our smartphones. That relationship, however, is often one-sided. Motorola surveyed 7,112 adults in seven countries1 to understand the good, bad and awkward relationships that people have with their phones. 1 Motorola Global Smartphone Relationship Survey was conducted by KRC Research via an online survey June 29-July 13, 2015. A total of N=7,112 smartphone owners ages 18+ were interviewed in each of the following countries: U.S. (N=1,181), U.K. (N=939), Brazil (N=971), China (N=1,018), Spain (N=1,006), Mexico (997), and India (N=1,000). It might not be something we like to admit, but we’re all in serious relationships with our phones. We trust them with our most personal questions, photos, stories and secrets. They never leave our sides. Most of us have slept with our phone1. And nearly 1 in 5 people would be more willing to give up seeing their significant other, showering or sleeping than having to go without their smartphone for a weekend1. Now that’s devotion. But let’s face it, most of the time, these relationships are one-sided. Our phones simply aren’t as devoted to us as we are to them. They desert us with a dead battery when we need them the most, embarrass us during important meetings, and pester us while we’re driving, demanding we take our eyes off the road to pay attention to them. And needless to say, most of the time, our phones rarely match our personal style. No wonder less than half of people say they are happy with their phone. At Motorola, we believe everyone deserves the choice of a better mobile relationship. One that is personal, fulfilling, stands the test of time and fits your budget. Your phone should know you by the sound of your voice, but also realize when you want to be left alone. It should offer a customized look that perfectly complements your individual style. It should keep you safe with easy-to-access, hands-free control. It should grow with you, learning your preferences and habits, getting better over time. And it certainly should be with you for the long haul: durable, water-repellant, and backed up with lifetime customer service. Today we are announcing the next generations of our most popular phones — Moto G and Moto X — giving you the mobile relationship you never knew existed. The new phones feature best in class cameras, meaningful software experiences and personalization options - all at exceptional prices. The new Moto G is ready to weather any storm with you, literally, thanks to IPX7-rated protection and Corning Gorilla Glass, so you’re safe from accidental drops into water2 as well as unsightly scrapes and scratches on your display. With an all-day battery3, it won’t ever bail on you when you need it most and it’s ready to capture new memories with a flick of the wrist with a 13 megapixel camera. Personalize Moto G with Motorola Shells available in a variety of colors. And now, Moto G can complement your personal style even more with customization options on Moto Maker4, our online design studio where you can pick the colors, memory and accents to make your phone as unique as you are. New in 2015, we’re expanding Moto Maker into Brazil, where Moto G was the best-selling device for a year. Moto X Play With up to 48-hours of battery life and a water-repellent design, Moto X Play will love you back day and night, rain or shine. Stay connected on your commute, at work, at play and whenever you need it most—and still have enough battery to get you into the next day. Take brilliant photos and stunning videos with its 21 megapixel camera, and show them off on the edge-to-edge 5.5-inch HD display. And living up to its name, get all the power you need for gaming, streaming and multi tasking at the speed of life with a Qualcomm® Snapdragon™ processor. Moto X Style Looking for a phone that doesn’t compromise, offers powerful performance, and looks gorgeous all at the same time? 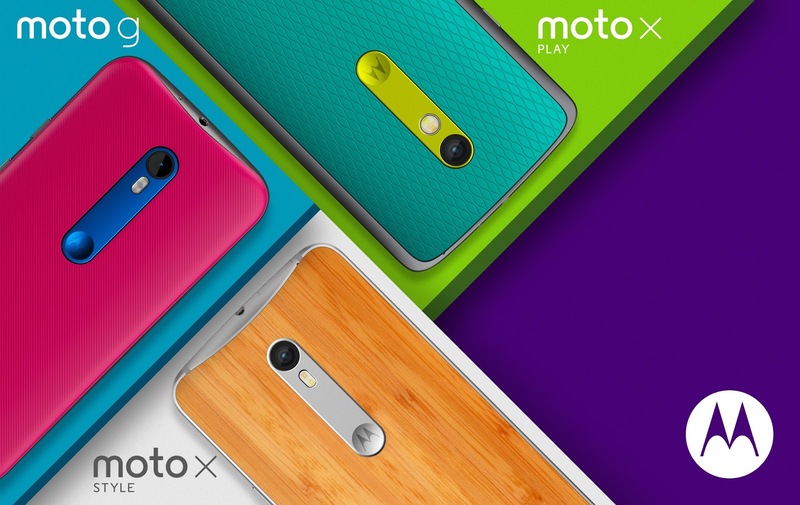 Then the bold new Moto X Style is for you. We certainly wouldn’t call it “Style” if it didn’t complement yours, offering more customization options than any other phone on the market. Make yours a true reflection of you by choosing from a variety of vibrant colors or authentic materials including new Saffiano leather and real wood with unique grains. Immerse yourself in entertainment with an expansive 5.7-inch edge-to-edge display that’s enhanced by rich stereo sound. And when your battery needs a boost, the world's fastest charging smartphone5 will get 10 hours of power in just 15 minutes of charging with TurboPower. With all three of these new smartphones, we’ve used some of the most advanced camera technologies available, so Moto X Style now boasts one of the best cameras in the industry. You can take crystal-clear photos and video with the 21-megapixel camera or look your best in selfies or video chats with the 5-megapixel front-facing camera featuring a wide angle lens and selfie flash. This is our biggest Moto G launch yet with availability in more than 60 countries throughout North America, Latin America, Europe and Asia Pacific starting today. Check your local web sites for pricing, but one thing is certain, we’ve made sure that every Moto phone is offered at an amazingly competitive price and delivers premium value. Moto X Play will be available starting in August in various countries across Europe, Latin America, and Canada (sorry, it won’t be available in the US, but we’ll have more choices for you all later this year). Moto X Style will be available in countries across Europe, Latin America and North America starting in September. We’ll share news for Asia Pacific, including more on China and India, later this year. Catch a replay of our announcement livestream here. 2 Designed to withstand immersion in up to 3 feet/1 meter of fresh water for up to 30 minutes provided the back cover is properly sealed. Not designed to work while submerged underwater. Do not use while swimming, or subject it to pressurized streams of water. Not dustproof. See Motorola.com for details. 3 All battery life claims are approximate and based on a standard mixed use profile. The mixed use profile is based on Motorola devices on major 4G LTE networks with excellent coverage and includes both usage and standby time. Out-of-box settings are applied to the mixed use profile to project battery performance. Actual battery performance will vary and depends on many factors including signal strength, network configuration, age of battery, operating temperature, features selected, device settings, and voice, data, and other application usage patterns. 4 Moto Maker not available in all markets. 5 Based on average smartphone charging rate (mA) in the first 15 minutes and over the entire charging cycle. Tests compared other 2015 premium smartphones with >= 2500 mAh batteries using their in-box rapid charging solution. Testing as of July 2015. We need to talk. It’s not you. It’s your phone. Sure, we know you love and depend on it, but the time has come for all your care and devotion that you show your phone to be returned. 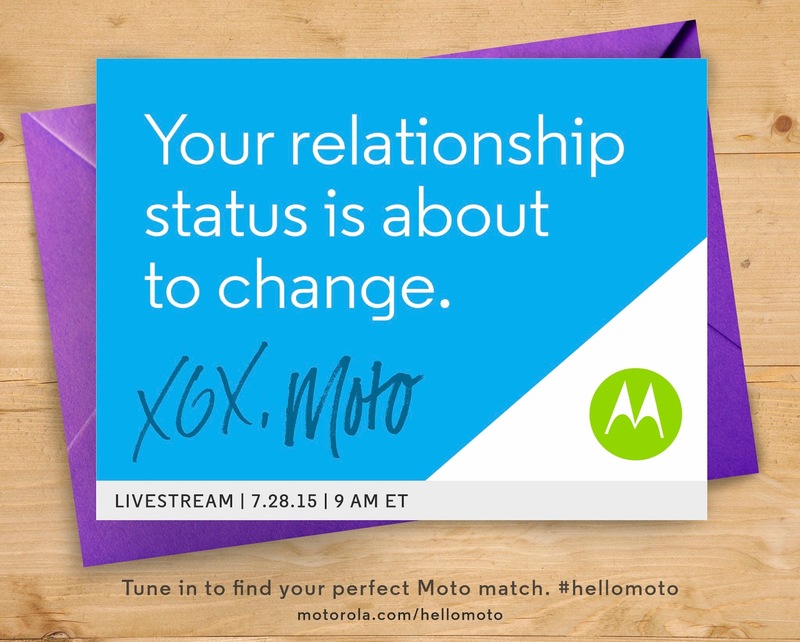 We have some news to share, so tune in to find your perfect Moto match on July 28. Save the date — a better mobile relationship is headed your way.